Dedicate 15-20 minutes of each day to training. Maintain your composure, and always be aware of the four things required to produce a good training session; Timing, Patience, Motivation, and Consistency. You must learn what makes the dog respond in the manner that he does, and what prompts his actions that irritates his you, his owner. Knowing and understanding why dogs do what they do will help you to figure out the problems you are experiencing, ease the lesson you want to teach, help you and the dog achieve a level of acceptance of each other, and enjoy a mutual respect. I am often asked why a dog will respond to my commands without question and perform the feat that I want them to do. The secret to training, or being successful in any endeavor, is YOU. You must commit to the training program and the dog. Training will last approximately 15-20 minutes each day for five days each week. You are undertaking the training of a living, thinking animal, and you must make a commitment. The dog may not think on the same level as a human, but it does think, and if you do not occupy his mind, he will find something that will. Its powers of reason are limited, but its instincts are greater than ours. It is your job to teach him to comply willingly to your commands, and withoug fear. Training is dependent on YOU. Almost any trainer can handle your dog and have him respond to the signals or commands they have instructed. It is up to YOU to continue with that training and maintain an active part in the dog's life in order to see results. Training is a never-ending process, and must be performed periodically if you want your dog to obey. If you do not train periodically, your dog will not respond as quickly to your commands. Just as you learned to do mathematical equations with fractions, the lack of practice in using them will cause you to pause and think of how to resolve a problem. The same situation exists for your dog. YOU must make time and work with him periodically if you want him to respond to your commands. Spending a small amount of time training your dog will promote a wagging tail and an eagerness to please. Training your dog is up to YOU! Not taking charge of the dog as would be the case in a pack. Failing to make necessary corrections at the time they are needed. Failing to take charge is the situation most often encountered. Owners will talk, yell, curse, and scream commands at the dog, but this is not leadership. This is the result of frustration. Unless the dog is taught what is expected of him, he has no idea of what you want. He does not understand our language, so you have to teach him to perform a particular action when given a particular command. In order to be a leader, you have to use praise and discipline equally, and in a fair manner. When these are not followed, the dog will take control of the owner, and the owner may not know how to regain their position of authority. It is really quite simple. Stand up to the dog. This does not mean that you have to beat him into submission, but you must assume your role as a leader by making your wishes known and bringing him into compliance. It means that when the dog is not doing what you desire of him, you must teach him what is acceptable, and correct any unacceptable behavior. If the dog is never shown or taught what is acceptable, how can he know? When I present the proper method of correction, the statement most often heard by the owner is, "I don't want my dog to hate me," and a correction is never given in the manner required to get his attention. As time goes on, the owner begins to hate the dog for not complying with his commands, and it is not the dog's fault. Your dog will not hate you for making a proper correction. In fact, when discipline and praise are applied in the proper manner, your dog will respect you and your authority. Corrections are a necessary part of life for both humans and animals. If it were so simple that an explanation would suffice, we could do away with jails, both human and animal. 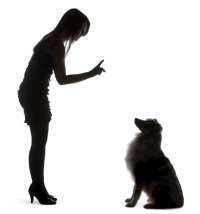 Since that is not likely to happen, how can you expect a dog to understand human thinking? It cannot, so it is up to you to teach him what is acceptable. A dog responds to a series of repetitive reactive mechanics. You tell him to sit, and he does. He already knows how to sit, but, because you have given him lessons in understanding a word or phrase, he complies with the action. If the dog were never taught to react to this command, you could be saying sit until the sky turned green, and the dog would probably look at you quizzically, then just walk away. Regardless of what feat you teach your dog to perform, whether it is heel on lead, come, fetch or search, his training must be renewed. In other words, once your dog has been trained to perform, he must practice that training, or he will not be as sharp as when you were teaching him. When you are teaching your dog to perform a certain function, he is reminded of what he must do on a regular basis. This is how he learns. Will he remember this? Of course he will, but, if you do not work with him occasionally, he will become slower at performing, or he may become confused by what you want from him. Training should be an ongoing lesson. Once he is taught, he should be worked on a regular basis (once a week) to ensure that he remembers what you want from him. Think of training your dog in the same way as working with fractions. When you were in school, fractions were taught and it was a daily ritual to maintain the use of addition, subtraction, dividing, and multiplying certain given fractions in order to achieve a result. It was fresh in your mind, and it was not that hard to figure out. If you have been out of school for more than two years, and have not worked with fractions, you would have to stop and think about what you were taught before you could actually work the problem. Your dog's training is exactly the same. If you don't use it, you lose it! Once trained, every dog should have a weekly regimen of his lessons to keep him sharp. Athletes continue training to make them better and keep them sharp. So should you and your dog.